Finally. I finally ordered my wedding pictures. For more of this week's Saturday Snapshots, visit Alyce with At Home With Books. Those photos look amazing! Did you get married on the beach? Love the dress! A beach wedding was always one of my dreams. It didn't happen but I love seeing photos of them. How very lovely! Your dress looks fabulous and you guys look very happy. Thanks for sharing with us! How sweet! I love it. You guys are so cute. I love wedding pictures on the beach. You all look like movie stars! And what a clever way to show the pictures! I'm sure those are gorgeous photos. You and Jason are adorable together! It looks like you had a wonderful wedding, and I love the beach pictures! I haven't ordered mine yet as I can't choose just 30 favourites. I love the angles in this - what a great picture! I like that shot of all of the photos - it looks like a collage. 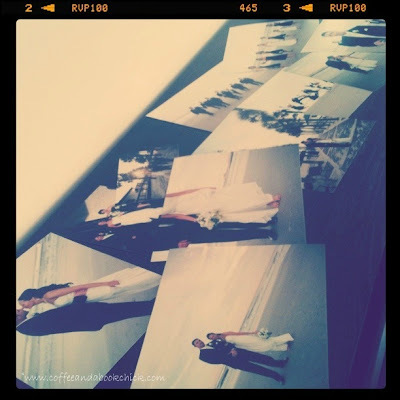 Love that photo of your photos! Neat idea. What a great way to feature your treasured memories - and how gorgeous you and Jason both look together! Looks as though you had a beautiful day for your wedding on the beach. I love this pic.... that should be the cover of your wedding album! Your wedding photos look beautiful. I love the photos you took of all of your photos...it's a great angle and it looks like your weddings pics go on for miles! Oh a beach wedding; how special. Nice collage of the wedding photos, looks cool.